Blockchain has been around for a very long time now and more than that, it has been turning the previously existing technologies around upon a whim by its possible, practical and theoretical applications in everything. Although, still in its nascence, it has been more useful to every possible industry on this planet. Similarly, IoT or Internet of Things is in its initial phases, still blooming, but the stir it has created in the world it unparalleled (or only comparable to blockchain). These two have become the epitomes of technology and the minute they come together, it produces an endless network of interconnected devices sharing the entire world’s data among themselves and the external environment, functioning perfectly without the intervention of humans. To define these two simply, Internet of things is the internet of everything. It is every device you can put the word “smart” in front of. Your phone, TV, lights, air conditioner, coffee machine, anything, and everything. The interconnected web of hardware devices that are able to communicate, share data among themselves and the external environment and function perfectly without the intervention of humans. 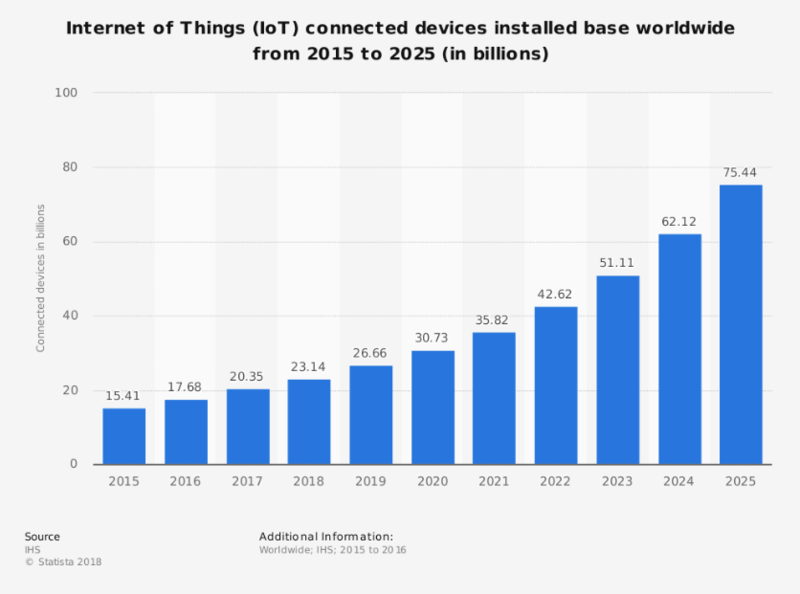 There are multiple predictions made on the subject, let us look at what amount of IoT connected devices will be installed worldwide till 2025. In contrast to the interconnected net of hardware device system in IoT, the latter, as explained in much detail in our Blockchain guide for Entrepreneurs, is a digital decentralized ledger which is encrypted and distributed through filling systems that allow the creation of immutable, real-time records. These two have proven themselves to be the future of technologies. In theory and in practice, the applications of Blockchain and Internet of Things together are breaking the set norms and overall limits of what technology could do. How does Blockchain fit into IoT? Theoretically speaking, (Blockchain of Things) merging blockchain and IoT together will give us a verifiable, secure and permanent method of recording data processed by almost any (smart) device today. And the result of this will be an endless network of interconnected devices sharing the world’s data among themselves and the external environment, functioning perfectly without the intervention of Humans. Published in March 2017, A Gartner study revealed that Blockchain will add a business value of over $176 billion by the year 2015, later exceeding till $3.1 trillion by 2030. And Forbes forecasted in 2017 roundup that the IoT market will grow to $457 billion by 2020 from $157 billion in 2016. Talking practically, despite an advancement so big, the security concern in the IoT market remains a huge issue, since it exposes multiple devices and a huge amount of data to security breaches. If we take an example, the privacy of data in sectors such as healthcare and finance is paramount but if IoT is allowed to regulate these two industries, and multiple devices are allowed within the ecosystem to exchange data, the entry points for hackers will also multiply, thus risking data security. Exploitation by cybercrime on IoT devices – Software attacks by malware and viruses and physical attacks through unauthorized device control. Network attacks like the denial of services and wireless vulnerability exploitation. Here enters Blockchain technology. The fact that there are numerous kinds of attacks and threats to keep IoT far from being safe is testimony enough that it needs an external security system to function. If IoT devices are directly connected with Blockchain technology, it will help in keeping a track of the history of all the connected devices for any troubleshooting purposes. Although, the initial costs of the two technologies together can be high in the present scenario when they are just starting up, the final costs or the costs in more mature phases of the technology can be reduced since the need of an intermediary can be reduced to zero. Blockchain development companies are working towards a more sustainable model in the same aspect. A distributed decentralized leger can eliminate a single source failure in the IoT ecosystem protecting all the devices’ data from collusion and tampering. Blockchain will provide a distributed system for record sharing of data across a decentralized network of stakeholders. Blockchain also enables device freedom through smart contracts. It provides independent identity, data integrity and peer-to-peer communication support and safety through the removal of technical inefficiencies. Blockchain’s hash-based security and identity verification code can be crucial for the security loopholes in IoT. Blockchain can also provide consensus and agreement models in form of smart contract for avoiding the mitigating threats. A merger of these two technologies or Blockchain of Things will disrupt the existing ways of working of various industries such as manufacturing, healthcare, shipping, finance and so on and simplify the business processes, thereby, improving customer experience. 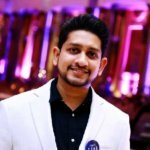 What are the challenges faced in IoT and Blockchain integration? After understanding that Blockchain integration with IoT can benefit into Building trust, reducing costs and accelerate transaction time, let us have a look at what are the major challenges that are faced in IoT concept and more importantly, how will blockchain reduce or eliminate them. So, like any other technology, there are always loopholes or bottlenecks in IoT and Blockchain integration as well. Namely, the issues of scalability, Security, interoperability, Multiparty collaboration, etc. Let us look at these, one by one. Scalability: The most urgent technical challenge being faced in DLT and IoT convergence is the ability to scale the requirements of services and security over a dynamic network of devices. A decentralized consensus mechanism might save us a great deal of Information neutrality, Authenticity, security, fault tolerance, etc. Problems such as the unsustainability of processing a vast network of nodes for every transaction, the cloud-based architecture of blockchain, limited bandwidth, traditional data storage structures, etc all make up the redundancies of DLT and IoT implemented on their own. In other words, DLT is not a solution for IoT’s scalability problems, rather scalability will be defined when, how and in what scenarios IoT and DLT will converge. Security: DLT architectures (like blockchain) provides the world with a promise of data security while it remains a challenge in a shared device network (Like IoT). Any business should not only be concerned with the protection of data (contacts, files, etc.) but, it should also work towards maintaining privacy, authentic identity and prevention of data theft. Having blockchain introduced along with IoT institutes new design considerations across the stack. Interoperability: It is the ability to securely interconnect multiple networks. And this is a challenge faced in both the domains IoT and DLT (blockchain). Complexities like the integration of private and public blockchains, designing the permission and data access across multiple blockchains, integrating multiple open source platforms, ensuring common standards for compliance, etc. are standing in the way of IoT and DLT to become a standalone technology where interoperability is concerned. Multiparty Collaboration: Standard business instincts are competitive, interdependent and shared in nature. On the other hand, the IoT market is a product based market, but our current business needs are pushing it towards a data-driven and service-based approach. Therefore, the need for collaborating blockchain with IoT is paramount. For interactions such as multiparty integration with major systems, security and permissions testing across parties, Encoding and designing and implementing the shared framework that complies to regulations. Blockchain will demand multidisciplinary integration to define new laws and liability frameworks rather than requiring the coming together of estranged participants. Although looking from afar, the ideas around the concept of IoT and blockchain seem to be a technology in future but it is already here and has been implemented quite successfully over a large bracket of things. According to IDC, 20% of all IoT deployments will enable blockchain-based solutions by 2019. Banks such as ING, HSBC, Deutsche Bank are deploying PoC to validate blockchain technology. Blockchain and IoT applications are endless. A supply chain network working on a global level involves multiple stakeholders. They can be people from raw material providers to processors to packagers etc. Thus, making the end-to-end visibility more complicated. Having multiple stakeholders also means that the chain can extend over months of time having a multitude of payments and invoices. This also makes the delays in deliveries very frequent. All of these challenges faced in Supply chain management call out for a solution that consists of features that are taken from both IoT and Blockchain to solve particular issues. For instance, Blockchain and IoT can be combined to provide an enhanced reliability and traceability of the network. IoT sensors like, GPS, motion sensors or any other connected devices provide absolute details about the status of shipments, and then this collected information can be stored in the form of blockchains. Once this information is stored and available for access, all the stakeholders listed in the smart contract can access this information in real-time. Post this, the payments and invoices can be prepared accordingly at all nodes. A food supplier company – GSF (Golden state foods) is a very known food products manufacturer and distributor. 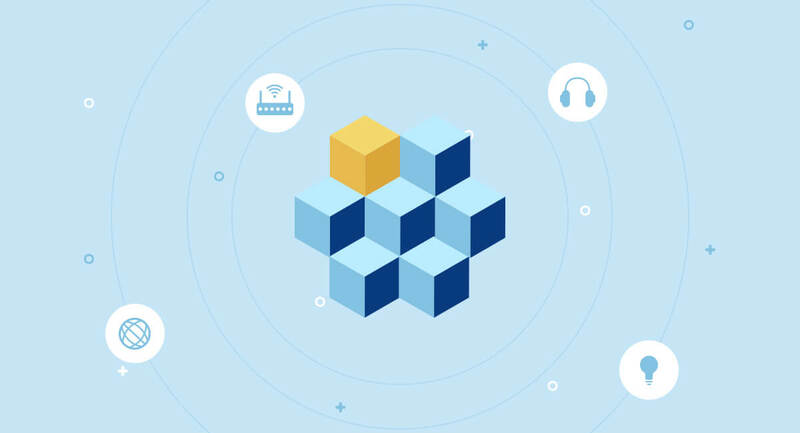 GSF is currently working with IBM to optimise its business procedures making use of IoT and Blockchain. All the sensors data which is collected on the blockchain makes sure any problematic data is reported before becoming a big issue. With the integration of Blockchain and IoT, GSF can create an immutable and transparent ledger which is accessible by different stakeholders in real-time. Blockchain and IoT integration can disrupt many areas of Automotive industry such as fuel payment, autonomous cars, smart parking and automatic traffic control. The automotive companies using IoT enabled sensors can integrate them with the decentralized network which will enable multiple users to exchange crucial information quickly and easily. For instance, NetObjex has exhibited a smart parking solution with the collaboration of Blockchain with IoT. this integration eases the process of finding a vacant place in the parking lot of a place and automates the parking payments using crypto wallets. Blockchain for IoT security payment methods is the new way to go. The collaboration has happened with a parking sensor company called PNI for incorporating real-time vehicle detection and finding an available parking space. The IoT sensors calculate the parking charges for the duration of use and the billing is done through crypto-wallets. IoT-enabled “smart” devices play a day to day a crucial part of our lives. For one common example, IoT enables our home security systems to be easily managed from a remote control. But the traditional approach to home security using IoT sensors is centralised and thus lacks the security required. The introduction of Blockchain in this system can enhance the home security manifold. Blockchain for iot devices can be a boon in home security. Sharing economy or collaborative consumption is concept based on haring. Start-ups such as Airbnb and Snapgoods are two good examples of what sharing economy is and unarguably, it has become a widely accepted concept around the world. And blockchain can help it in creating decentralized shared economy applications to earn revenue. Theoretically (Still), it will have an Airbnb apartment which rents itself. But this conceptualization is not much far off. Because Slock.it is doing it by integrating Blockchain with IoT. They have planned to develop a USN (Universal sharing network) to form an online marketplace of connected things. With the help of USN, any object possible can be rented, sold or shared without the intervention of any intermediary. As far as the vision goes, it will be possible for third parties such as manufacturers or retailers to upload any object to USN without seeking permission. And the data will be secured and transparency will be maintained with the help of smart contracts. These were some of the real-life use cases where these two amazing technologies have merged and given out their best to the world. Blockchain for IoT has made the world a safer, more secure place in terms of technology. IOTA – It is a new transactional settlement and data transfer layer for IoT which is based on the DLT, the Tangle. It efficiently overcomes the inefficiencies of current Blockchain designs and institutes new ways of reaching consensus in a decentralized peer-to-peer system. In other words, it is a cryptocurrency which is designed for IoT. And it has some major benefits over Blockchain such as Scalability, Absolute decentralization, Modularity and It is free of cost. Unlike the other most popular cryptocurrency – Bitcoin, it uses the DLT called Tangle instead of Blockchain. And it solves the issues of scalability and transaction fee faced in Bitcoin by making the sender in the transaction to perform a proof of work which approves two transactions. Chain of Things – “The chain of things of CoT is a general intelligent hardware infrastructure platform based on multi-chain blockchain technology.” Its vision is to introduce more trusted identification, transactions, interactions and transfers using various links with the base of IoT intelligence hardware system and serve various business entities with customisation. IoT Chain – It is developed as a lite operating system using the blockchain concept and implementing PBFT (Practical Byzantine fault tolerance), DAG(Directed Acyclic Graph), SPV, and CPS technology, allowing data to be layered and stored in a decentralised manner and providing protection with the combined power of millions of IoT nodes within the network. Using this hybrid approach, a decentralized IoT network of unparalleled speed and security has been created that allows users to maintain data sovereignty. As we move forward, the future has started to seem closer than ever. Looking at the technologies which have already been put into practice using the Internet of things and blockchain is mesmerizing as it is exciting. There will be a time, as mentioned at the start of this article, that we are on our way to creating a technology which will enable every hardware device to operate on its own without any human intervention. Wonder what it will be like to add AI to IoT and blockchain. Until next time.